Pawnee Valley Community Hospital is located in the city of Larned, Kansas, which was founded in the 1870’s along the famous Santa Fe Trail. Larned has a population of under 4,000 individuals and was at risk of losing its hospital before the community made a concerted effort to keep it. Ultimately, HaysMed stepped in to offer management services and Health Facilities Group was hired to design a state-of-the-art Critical Access Hospital. In addition to aligning hospital services with local demand, HFG understood that in order to serve as much of Larned as possible, Pawnee Valley Community Hospital would need to be an inviting and comforting space. Fulfilling this vision, the hospital’s corridors exhibit regional artwork, displayed under museum-quality lighting. This gallery motif continues into patient rooms, where original works of art are placed above patient beds. 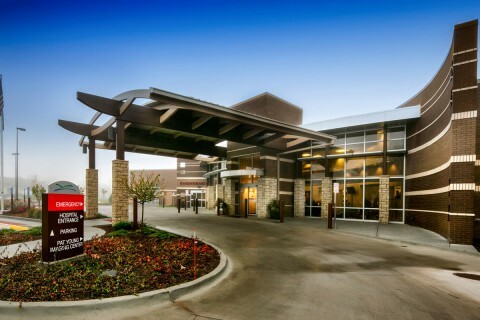 By refining a unique aesthetic experience and customizing facility function to match demand, HFG was able to help ensure that the small community of Larned, Kansas could sustain its own hospital. Health Facilities Group master planned and designed this 49,000 SF Pawnee Valley Community Hospital replacement facility. The new Critical Access Hospital offers a variety of necessary services to the rural community of Larned, KS, including a new emergency department, imaging area, and specialty outpatient clinics. The new hospital was built on the existing site next to the old hospital, which was torn down after project completion. Health Facilities Group’s key services included healthcare planning, space evaluation & programming, state-of-the-art medical design, economic analysis, estimating services, construction phasing, and public awareness support.